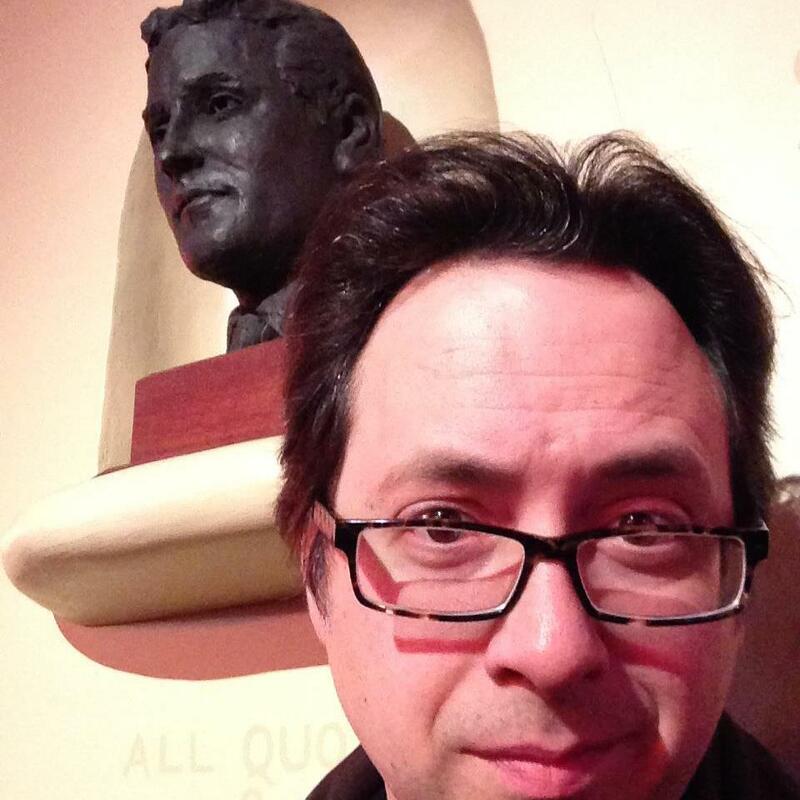 Bill Stiteler is a man who touches the Twin Cities geek community in many different ways. He directed the film Thac0, about geeks playing role-playing games in a basement, as well as multiple Fringe shows; he is involved in CONvergence; and he is an avid podcaster. I recently sat down with Bill to discuss his life as a geek and his new project A Klingon Christmas Carol, playing this December at the Historic Mounds Theatre. Duck Washington (TCG): What does the word geek mean to you? Bill Stiteler: Oh boy, it’s changed so much. 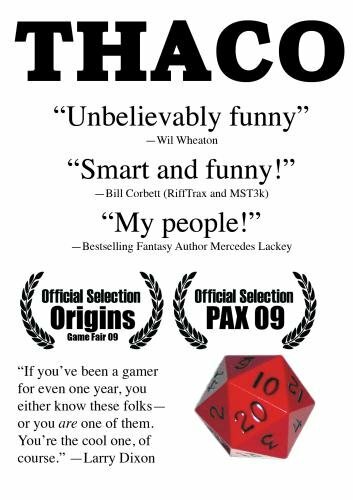 When I wrote Thac0 I actually had a monologue where I described the difference between being a nerd and a geek where I described the geek as being more obsessive. I don’t think that’s true anymore. The terms have changed so much since I was a kid. The idea that people have to prove that they are a nerd these days will never make me stop laughing. I grew up when it was a pejorative, and I think it just means that you are into something. I know people who are geeky about trees or geeky about knitting. It just means that you have an obsession and that you love it and that you are not ashamed that you love it. TCG: What kind of geekdoms are you into? Bill: I’m a classic, classic nerd. I grew up with Star Wars and all that stuff. Right now I’m still very nerdy about fountain pens. Mail, like actual letters and postcards. This is the perfect example of what I was talking about: A couple of months ago I went to the Twin Cities Postcard Collector Show, which I absolutely loved. It was in a small room in a disreputable hotel, just like comic-book shows used to be, and there were just all these people who had these massive boxes of completely organized postcards. Vintage postcards, some of which had never been used, some that had been written on, and I thought “Oh, this is what Twitter was before we had the Internet.” Not everyone had cameras, so there would be these postcards of the places you were and send them back. Nothing has changed; we just change the form we deliver them in. So letters and postcards are this really obscure area I’m interested in and then movies in general—I started off with geeky movies, but now I’m kind of obsessed with all movies. TCG: You are a director yourself and have been writing and podcasting things. Is there one of these things you like doing more than the others? Bill: Podcasting is so much easier to do. Theater is . . . well, I don’t think I will ever stop doing theater. I just love it so much. Filmmaking is the hardest to do, but it stays, it sticks around. But podcasting combines the ease of being able to do it with the obsessive and fun nature. Podcasting is definitely the most fun to do, the highest enjoyment-to-effort-you-have-to-put-into-it ratio. TCG: What podcasts do you work on? Bill: I do the Birdchick podcast with my wife, Sharon. I have a podcast called Brandi and Bill Talk about Blaxploitation, which is a podcast I do with Brandi Brown that is infrequently updated. And then I have another one called Movie Date with Bill, which is about the experience of going to a movie. TCG: So what inspired you to make that podcast? Bill: Once I started freelancing I realized I could go see movies during the day when there are not a lot of people around and it is super cheap, and I just really enjoy the experience of just seeing a movie in the theater. And then I thought, “Why do we still do this when we have streaming HD video and we can watch whatever we want whenever we want?” I started talking to my friends who are movie nuts and my friends who are not, and I just wanted to do this thing where we went to the theater and talked about the experience of sitting with just a few people or maybe a lot of people and why that’s different, and what makes viewing in a theater a valued experience. TCG: Are there any specific influences that inspire your writing, directing, or filmmaking? Bill: I think I have a tendency to overexplain things when I’m writing, which I think I get from a couple places. Monty Python’s writing—they had different styles of sketches, and one of them was to take an absurd premise and just explain the hell out of it. George Carlin—just his mastery of words, the way he could make words dance, was just huge. I tell people I appreciate music, but music never meant to me what it meant to other people. Stand-up comedy was my music growing up. I’d collect comedy albums and have favorite tracks. I have films that I love, but I don’t know that I can say any one has an influence on me. One of the things I really love is bad movies. I think bad movies are a film education in themselves—they teach you what not to do but they also show you what goes into a movie. If you watch Birdemic, which is a fantastic bad movie, it teaches you that you assume so many things in a movie. Like the sound is going to match from scene to scene and that lighting will match up. It exposes all these things that you would take for granted. It’s a really valuable film. TCG: Aside from Birdemic, what is another example of a bad movie that every filmmaker should watch? Bill: Oh boy, there are so many. I was so so happy when RiffTrax released Viva Knievel! because it is such an amazing vanity project. Glitter has nothing on Viva Knievel. The opening scene is Evel Knievel sneaking into an orphanage to give away toys of himself, which is just mind blowing to me. And one of the orphans even casts away his crutches because he saw Evel walk away. Evel plays himself in the movie—it is such an amazing ego trip. Love that movie. It is such an amazingly bad movie. TCG: Tell us a little bit about A Klingon Christmas Carol. Bill: Klingon Christmas Carol is exactly what the name describes—it is the Klingon version of Charles Dickens’ A Christmas Carol. It is a very fascinating play because there are some funny moments in it, but it is not a comedy. In this version, the idea isn’t that Scrooge needs to become more charitable; it’s that he needs to awaken his warrior spirit and become more passionate in life because he is a coward and has let so many opportunities pass him by to have died in combat. TCG: I know this production has been done before. What is different about your Klingon Christmas Carol? Bill: I can tell you what is unique for me. I’m used to being a writer, director, producer of shows. Being able to be in control and change anything I want. I’m used to writing comedy, and so much of what I focus on in comedy is the words and the pacing—and now I’m directing a show in a made-up language that I don’t speak, so I’ve been trying focus with the actors on the physicality of what they are doing. There is a narrator character who is a Vulcan who speaks in English, played by Dawn Krosnowski, and then everyone else speaks in Klingon the entire play. There are supertitles in English so you can follow it, but we don’t have those yet, so I am trying to just follow the play, and they are pulling it off and doing a very amazing job so that I am able to follow the scenes just from the physicality of what is going on. That’s been a challenging and expanding aspect for me. TCG: In your body of geeky projects are there any highlight geek moments that stand out? Bill: Thac0 was the first original work that I wrote was long form. It was a one-hour play. I wanted to write a play that I would go see, that was comedic but also very truthful to the experiences I had growing up playing Dungeons and Dragons. I think I pulled that off. We performed it in the Fringe Festival and it did very well, and then we made a movie of it. I got to go to PAX and Origins, and I got to show that off. I just enjoy working on these topics because I like rummaging around in my own mind. Tim Uren and I wrote a show called Macbeth: The Video Game Remix, which was really about video games and multiplayer games and the headspace you have to be able to get into to accept the reality of these games, the suspension of disbelief. Tim, who is a game designer, pointed out that strangely enough Macbeth has this idea of free will versus how much you are being guided along, and I just thought that was a fascinating thing to explore in a play about Macbeth as a video game. I co-wrote The Complete Works of William Shatner: Abridged with Tim Wick, and part of the reason we wrote that is because I really like William Shatner—I think that he is actually a really good actor and he is sort of really important. He’s sort of become a joke and is sort of in on the joke, but there is a really great Ki in there and I sort of wanted to explode that concept. TCG: If you could have any geek fantasy come true what would it be? Bill: I would have some sort of writing implement that would make it possible for me to get the vision of things in my head out onto paper perfectly. I want to make it possible for people to see the perfect version of what is in my head in the real world. TCG: And finally, who is your favorite captain? Bill: I’d like to have a more interesting answer, but everything in the Star Trek universe—every book, TV series, movie—revolves around a sun named Captain Kirk, and the nucleus of that sun is the performance of William Shatner. If you say, “Who’s your favorite Captain?” to me that isn’t really a question. 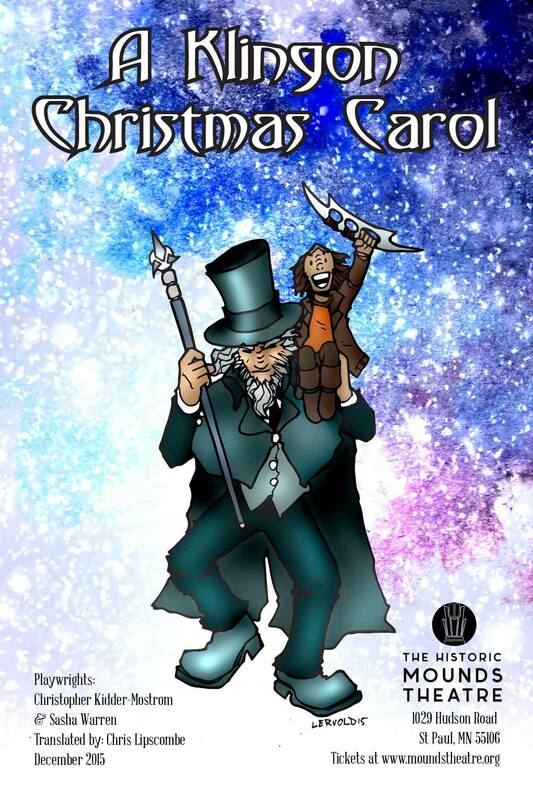 A Klingon Christmas Carol plays at the Historic Mounds Theatre December 3, 4, 5, 11,12, 18, 19, and 26th at 7:30 p.m. and December 20 and 27 at 4:30 p.m. General admission is $18 in advance and $20 at the door. More information on the show and the venue can be found at www.moundstheatre.org.